A New Map of Italy with the Islands of Sicily, Sardinia & Corsica. From Monsr. d'Anville: to which have been added the post roads and several other improvements. 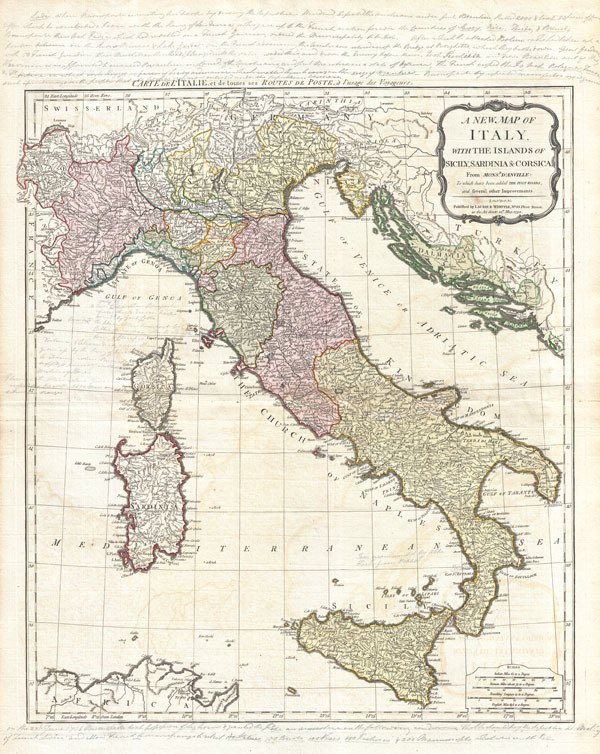 An rare and beautiful 1794 map of Italy by J. B. B. d'Anville. Covers Italy from Switzerland south to Sicily including Corsica, Sardinia, and parts of North Africa and Dalmatia. Italy itself is divided into various states, duchies, fiefs, and kingdoms. These include the States of the Church, Tuscany, Venice, Parma, Modena, Naples, Savoy, Milan, Piedmont, Genoa, etc. Offers an extraordinary level of detail throughout, noting post roads, towns, castles, monasteries, forests, swamps, rivers, cities and mountains. There are considerable notations in the upper margin, lower margin and in the Gulf of Genoa regarding the activities of Napoleon Bonaparte in Italy. These notations are in a light pencil and can be removed entirely at the buyer's request. For now, we have chosen to leave them as they are not disfiguring and, we believe, add a bit of historical context to the map. Published by Laurie and Whittle as plate no. 16 in the 1797 edition of Thomas Kitchin's General Atlas. Very good condition. Original centerfold. Light offsetting. Some pencil notations - see description. Blank on verso. Original platemark visible. Wide clean margins. Rumsey 0411.021, 2310.030. Phillips (Atlases) 4300-16, 699. OCLC 7160203. Shirley, R., Maps in the atlases of the British Library, T.LAU-1c (1799 ed.). National Maritime Museum, 375 (3rd ed. 1801).